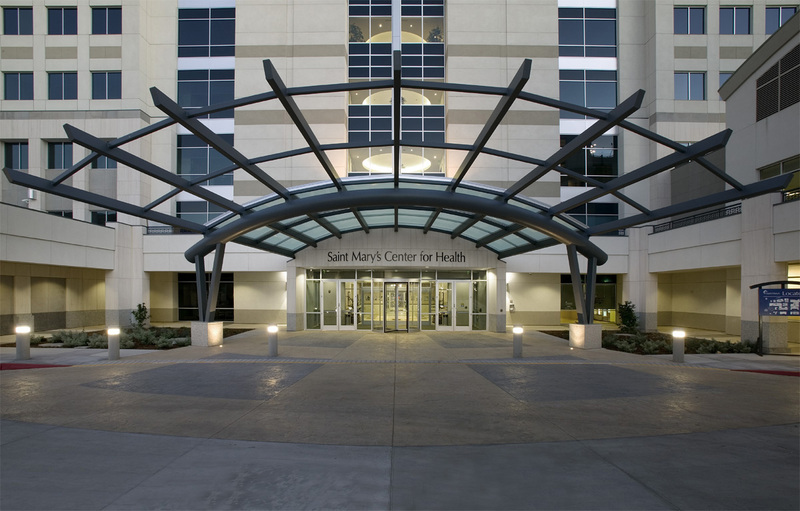 The Saint Mary’s Center for Health is the cornerstone of the west campus expansion for Saint Mary’s Regional Medical Center and provides the gateway for the entrance to the campus. Saint Mary’s Health Network’s master plan included a 5-year expansion program with the goal to correct space shortages and maximize density, avoid obsolescence, and maintain flexibility for future growth. Their vision was for the campus to achieve a fresh, new, pedestrian-friendly, “Hospital in a Park” atmosphere. 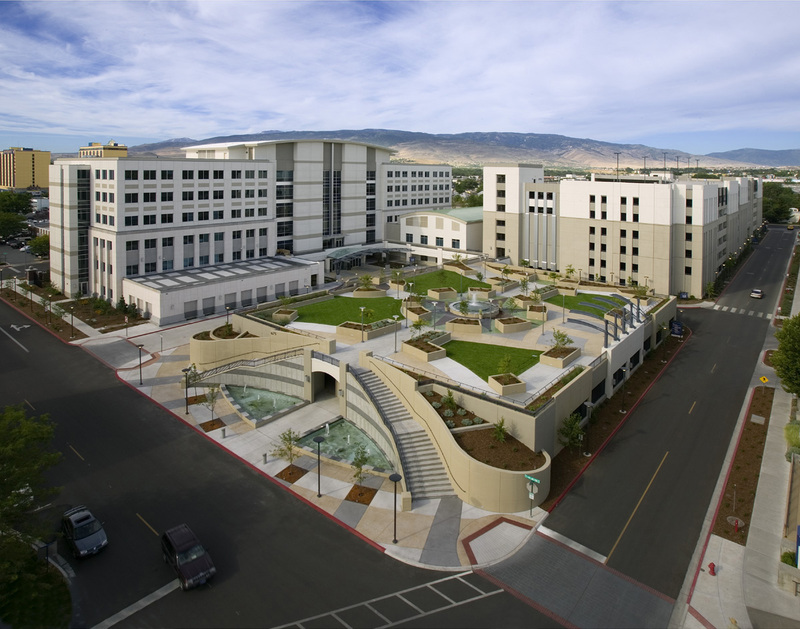 The Saint Mary’s Center for Health includes approximately 200,000 gross SF in a six-story plus basement building. The parking garage is five-stories and 1,100 spaces. The full development of the all-new west campus, including elevated public plaza, site work, parking garage, and the Saint Mary’s Center for Health encompasses 5.6 acres. Ensemble was selected following a competitive RFP process and was responsible for all aspects of project delivery, including master planning, financial structuring, development, and property management. The hospital had already expended approximately $1.6 million in architectural schematics for a 7-story professional office building on a 1.6 acre site adjacent to its existing pedestrian plaza area, with a 7-story parking deck. Their plan wasn’t flexible or feasible: the proposed building’s substantial load factor and high costs dictated a lease rate that neither the hospital nor the market could bear. Moreover, the hospital would not achieve its goal of a new campus look and feel. Saint Mary’s board had approved a budget for the project very early in the process, based on limited information. The central challenge was to create a cohesive facility to accommodate a diverse program of complex uses, while staying within the approved budget. Ensemble was chosen as the hospital’s development partner due to its value-driven approach that balanced the hospital’s aesthetic priorities and its financial needs with a seasoned developer’s perspective. The major complexity of the project was delivering a wide array of complex uses in the same building. Space-intensive uses were relocated to a new low-rise adjacent building, the parking and the public plaza were re-engineered and the building’s load factor was reduced. In addition, a detailed utility metering and sub-metering plan would allow for better fiscal planning and flexible lease structures. The hospital’s original architect was retained, avoiding additional expense. Major amenities, including a public wellness center, wound clinic and space for executive physicals, were preserved, while income-producing physician office space was increased. The revised building was a more feasible, efficient asset and revenue-producing investment. The Ensemble team streamlined project delivery by negotiating all of the major work with the same general contractor on a fixed fee basis. The team worked the schedule with a focus on delivery and operation of tenant areas in logical sequence rather than focusing on build-out of the shell only. This created a shorter schedule than if one contractor had been engaged to complete the shell, and then separate contractors hired for each tenant area. Total construction time on the Saint Mary’s Center for Health, including opening the Wellness Center and Radiation Oncology Centers, was 18 months. The garage was completed first and made available to the hospital in advance of completion of the balance of the project. Most of the major construction challenges were identified by the team prior to construction and resolved with design changes. Construction of the project commenced in August 2003 and was completed in March 2005. Types of tenants in the project include a wellness health center/gym, oncology, radiation, primary care, obstetrics and gynecology. Ensemble continues to provide property management and leasing services to the building.